Jendela di Bali is very different to most villas in Bali. 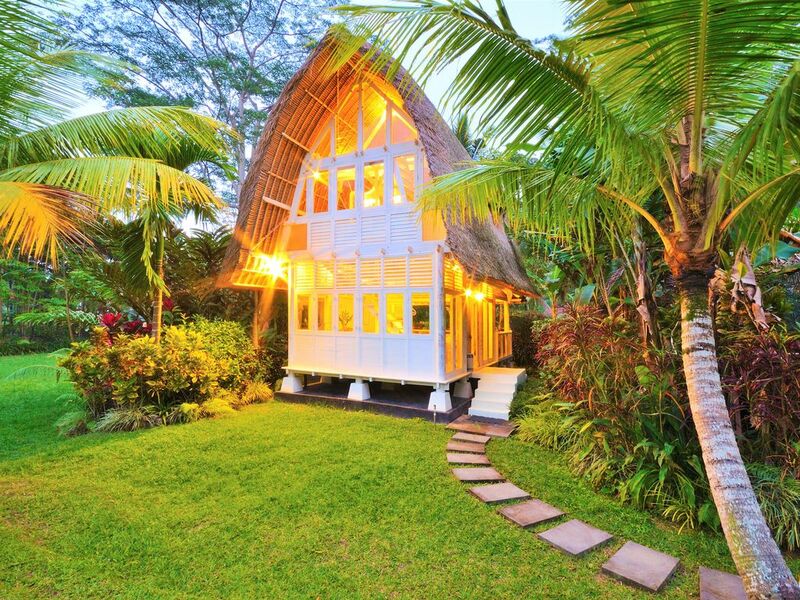 Instead of one building with lounge, dining, bedrooms under one roof, which is typical for most vacation rentals, It is a private villa comprised of a series of unique, handcrafted traditional buildings (called 'bales' in Balinese). So, this is a unique 'village' of living spaces, each artfully hand crafted to reflect traditional Balinese and Indonesian-archipelago architectural styles. Each bale is set within the estate's verdant tropical parkland gardens with a beautiful wet-edge pool, fountains, flowers and vibrant bird life, all for the exclusive enjoyment of one guest booking at a time. When you book our villa you get exclusive use of the whole estate and villa. So, when you book our villa you get exclusive use of the entire estate, which includes the pool, lounge and media room bales, all to yourself. You will never share the villa and pool with other guests….the whole villa estate is yours to enjoy, ensuring your complete privacy. So, whether you book one or two of the unique bedrooms, you and your group still get the entire villa and pool to yourselves. Generously, we do however offer a lower rate if you only need to use one of the two bedroom bales - but you still get the entire villa and pool to yourselves, even if you only need one bedroom bale. When you book the villa you get exclusive use of the whole estate, including the glorious wet-edge pool and gardens all to yourself. Whether you are dining poolside, reclining on the wonderful day bed cosseted by comforting cushions or relaxing in the armchairs made from upcycled former Balinese fishing boats, there is a space and place for you poolside at Jendela di Bali. There is even a hammock strung between a circle of palm trees to settle into and read and relax. The black volcano stone pool with its wet/infinity edge dramatically reflects the towering coconut palms that surround it. By day it is a cooling haven and by night the pool is a dramatic backdrop, reflecting the moon and stars above. Pool 7m X 5m, to 1.3m deep, Pool Bale approx size: 28sqm. The heart of Jendela di Bali is the Bale Bengong lounge and dining pavilion bale. This generous space offers a grand day bed dressed in regal fabrics, relaxing chairs, an elegant Javan-colonial dining room and French doors that look over the forested gorge and dramatic black-stone, wet-edge pool. There is a CD entertainment system (with connection for your media device) with music also piped to the poolside bale. There is also a small library of books giving an insight into Balinese, Indonesian and Asian cultures. Ceiling fans. Approx Size: 63sqm. Inspired by the traditional Balinese Lumbung (rice barn), The White Elephant is a grand guest bale. Just one glance shows off her elegant and romantic lines. Over three levels The White Elephant offers a living room, undercover deck with day bed, largely enclosed bathroom opening onto the deck. Upstairs is a romantic bedroom with spectacular vaulted alang-alang ceiling and a king bed dressed with crisp white linen and overlooked by traditional Balinese carved 'Bidadari' angles. Up on the third level, the small loft offers an intimate space to read or meditate, with views over the garden, ponds, fountain and the sacred village beyond. 'Wayang Kulit' is the backlit shadow puppet play that shares with the people the ancient Hindu stories, including the Ramayana epic. This beautiful, elevated bale is the perfect place to meditate, do yoga, read, paint or draw. For those seeking modern forms of entertainment, there is a flat screen TV with surround sound and DVD/CD, with Indovision cable TV discreetly within an antique Java cabinet. Jendela di Bali estate lies alongside an ancient gorge several stories deep. This natural amphitheatre forms a protective habitat for plants and wildlife, most notably the stunning azure blue Java Kingfisher with its amazing red beak. A myriad of bird life and a rainforest chorus call this haven home - even the occasional friendly monkey visits. The gardens of the villa extend this natural habitat and provide ponds and fountains for the enjoyment of birds, butterflies and guests alike. The estate size is approximately 2,400sqm. The Jendela di Bali estate will share with you the warmth, passion and culture of the Balinese. Step outside the gate and you'll discover a truly amazing panorama of experiences - sacred religious sites, temples, swathes of verdant rice paddies, waterfalls and world-heritage listed rivers all await your discovery. There is so much to see within easy reach of Jendela di Bali that a stay offers an endless string of adventures, flavours, cultural encounters - and that is not to mention the shopping, dining and indulgences of the charming village of Ubud. Experience more than just a villa It’s a place for joy and this is a design experience of 2 Bedrooms Villa with Unique style. Spacious tropical garden with cozy pool area. Feel the real Bali’s spirit within the villa and stroll through endless rice fields or wander villages famed for their wood carving. Within a short drive are dramatic rivers, some of Bali's most famous sacred temples, relic sites and steaming volcanoes and you might even be able to witness a local ceremony. Our villa is located in the rural of Ubud. Located in the best nature view of Ubud with no crowd and stay peacefully! I highly recommend this place to everyone I know. We had the whole villa for ourselves. The place is beautiful and well maintained by excellent staff. The villa was exactly I was looking for a place to stay, tranquil and yet the cottages are beautifully designed . I wanna say thank you to Dayu and Komang for their top notch services . They took care of our needs like we were their friends and family. They prepared our breakfast and dinner. I enjoyed Dayu's traditional Balinese meals. Komang helped us get around Ubod and different sight seeing place. Dayu and Komang made our stay unforgettable. For that I'm very grateful. We would like to thank you for your recommendations and We really appreciate you taking the time out to share your amazing review. It is wonderful to hear that Dayu and komang were able to provide you with the excellent experience we strive to provide all our customers. We count ourselves lucky for customers like you. We're happy that you're happy, and we're looking forward to your next visit.